What a beautiful beach house for small gatherings and intimate family bonding time! "TennesSea” is absolutely lovely, with beautifully landscaped exteriors, tasteful furnishings that include the decks, all ready for your family to visit the beach. The flooring is hardwood throughout and ceramic tile in the bathrooms. The only question you should have is "who gets the master with his and hers bathrooms?” Bathrooms have beautiful tile and the entire house is tastefully decorated. Two living areas allow the kids to have their own space…a real luxury in a house this size. Definitely a beach rental for guests with discriminating taste. The two car garage is available for guests, and has a ping pong table on one side. Not far from the beach either, as the house is close to a Sandbridge path to the beach access. Ground-Level: Den with LED TV, Gas Fireplace, Two Futons, Hall Bathroom with Shower, Queen Bedroom with Private Deck Access; Queen Master with LED TV and Whirlpool Tub; Garage with Full size Refrigerator, Washer/Dryer, Laundry Sink, Ping Pong Table. 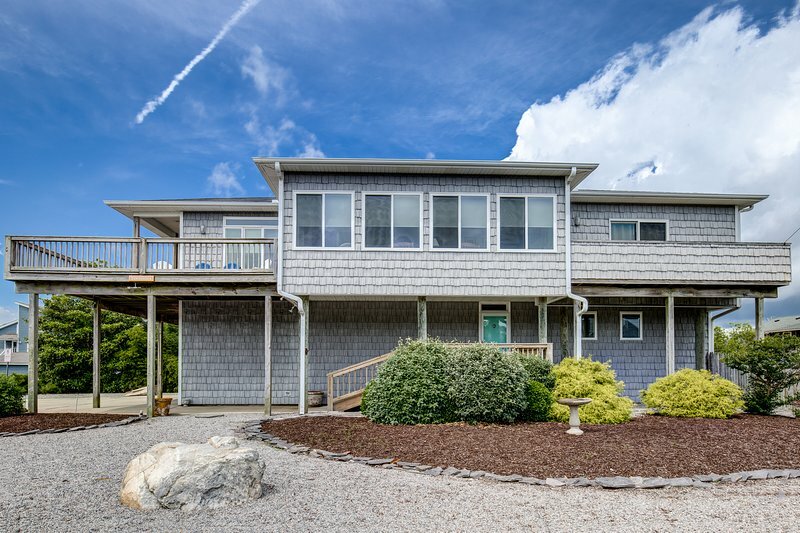 Extras: Wireless Internet Access, DVD player, Ping Pong Table, 2 Full Size Refrigerators, Gas Fireplace, No Smoking, PETS NOT ALLOWED, Parking: 4 Cars, Distance to the Beach: 635 ft.
Gas fireplaces are shut down from May 17, 2019 until September 15, 2019. What a beautiful beach house for small gatherings and intimate family bonding time! "TennesSea” is absolutely lovely, with beautifully landscaped exteriors, tasteful furnishings that include the decks, all ready for your family to visit the beach. The flooring is hardwood throughout and ceramic tile in the bathrooms. The only question you should have is "who gets the master with his and hers bathrooms?” Bathrooms have beautiful tile and the entire house is tastefully decorated. Two living areas allow the kids to have their own space…a real luxury in a house this size. Definitely a beach rental for guests with discriminating taste. The two car garage is available for guests, and has a ping pong table on one side. Not far from the beach either, as the house is close to a Sandbridge path to the beach access. Top-Level: Great Room with Hardwood Flooring, LCD TV, DVD, Gas Fireplace, Kitchen with Center Island seats 2, Dining Tables seats 8, Sun Room with seating and Game Table, Half Bathroom, King Master with LED TV, His and Her Walk in Closets, Master Bath with Shower and Clawfoot Tub, and Deck Access Ground-Level: Den with LED TV, Gas Fireplace, Two Futons, Hall Bathroom with Shower, Queen Bedroom with Private Deck Access; Queen Master with LED TV and Whirlpool Tub; Garage with Full size Refrigerator, Washer/Dryer, Laundry Sink, Ping Pong Table. Extras: Wireless Internet Access, DVD player, Ping Pong Table, 2 Full Size Refrigerators, Gas Fireplace, No Smoking, PETS NOT ALLOWED, Parking: 4 Cars, Distance to the Beach: 635 ft. Additional amenity details: Gas fireplaces are shut down from May 17, 2019 until September 15, 2019. All Sandbridge Blue properties provide bed linens, bath towels, beds made prior to your arrival, and a starter supply of: toilet paper, bathroom soap, paper towels, and dishwater detergent.